This cost-effective lightweight machine is perfect for site use and has a fully adjustable folding beam and clamping beam to facilitate metal thickness, straightness and clamping pressure. 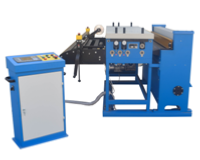 This machine is complete with a roller shear and back table for material support. Also there is an option for a backgauge. This cost-effective lightweight machine is perfect for site or workshop use and has optional back table, roller shear & manual roller. The MSL Shop-Mate is designed for heavy-duty workshop use. Featuring a unique open-backed construction, the Shop-Mate enables the user to achieve very wide and complex metal shapes. - Adjustable radius of bend. - All steel construction increases stability for every day workshop use. - Spring and gas cylinder system makes closing and bending easier. 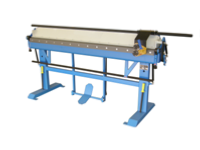 - Optional pedal, back table, back stop & roller shear available. The MSL Shop-Mate HD models are designed for ultra-heavy-duty workshop use. 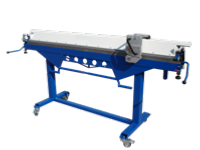 - Greater bending capacity than standard Shop-Mate models. 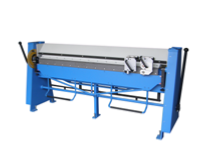 - Optional back stop, power back stop & roller shear available.